Looking for a side to my carnitas, I found several cans of kidney beans in my pantry. 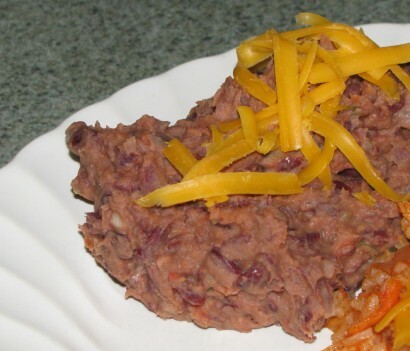 This recipe turned out to be my favorite refried bean recipe ever. Drain the kidney beans. Mash them with a fork or potato masher and set aside. Heat the rendered bacon drippings in a heavy skillet and add the flour. Cook, stirring, until it begins to brown. Add the beans and the remaining ingredients to the skillet. Cook and stir for about 20 minutes or so until most of the moisture is absorbed into the beans. Serve garnished with shredded cheddar cheese, if desired. This makes 2 generous servings.